U.S. stocks advanced for a third straight week, with all three major domestic equity indices finishing the week at all-time highs. Investors’ bullish appetites were sparked after President Trump announced that he will be releasing details on a “phenomenal” tax plan in the coming weeks. Wall Street is hopeful the announcement marks a shift away from trade protectionism and security towards action on his pledged pro-growth policies. Officials at Investor Intelligence reported Wednesday that its survey index of bullish U.S. equity newsletter writers was at 62.7%, its highest level since December 2004. Raw materials producers saw the strongest gains last week as the U.S. Dollar Index advanced for an eighth day, while energy producers followed closely after comments from Goldman Sachs energy analysts saying OPEC will succeed in winding down a global oil supply glut. That news helped lift oil futures to nearly $54 per barrel. The S&P 500 rose +0.87% last week, the Dow Industrials advanced just shy of +1%, and the MSCI EAFE (developed international) fell -0.02%. It appears that the earnings recession for S&P 500 companies is now behind us, with negative effects from low energy prices abating. However, Wall Street is facing a new set of challenges, most notably of which is lower-than-expected wage growth. Wage growth is not inherently a threat to corporate profits if sales can grow to compensate. Contrarily, in the absence of rising revenues, the increase in consumer incomes can erode corporate profitability, all else held equal. As jobless claims fall and unemployment hovers below 5%, it seems that a rise in wages is all but certain. But is this really the case? 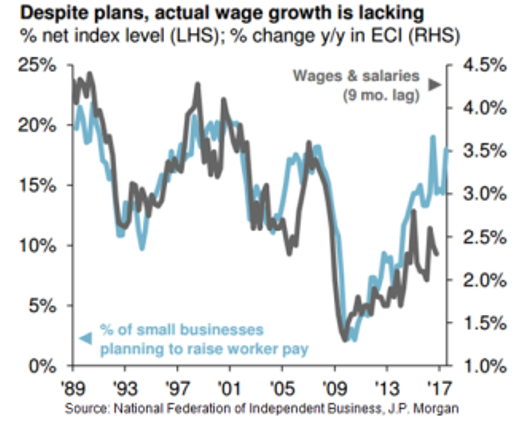 As shown in Chart 1, actual wage growth has lagged substantially behind planned wage growth, as measured by the National Federation of Independent Business (NFIB), for several years running. This indicates that while corporations have felt comfortable enough in the current economic landscape to raise wages in theory, these increases have yet to fully materialize. In the absence of weak economic data, there may be something else causing this discrepancy. According to J.P. Morgan, several structural issues may be contributing to weak wage growth, including the retirement of baby boomers, continued declines in union membership and a growing number of citizens excluded from the job market for various reasons. All in all, investors should be mindful that there is more to the wage growth puzzle than first meets the eye.